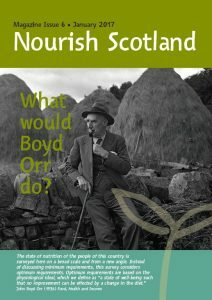 Magazine Issue 6 (PDF, 1.5MB) What Would Boyd Orr Do? Magazine Issue 5 (PDF, 3.3MB) What has Europe ever done for us? 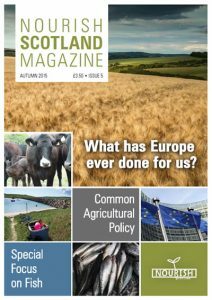 Contents: Editorial; View from Holyrood; Scottish farming and the CAP – challenges ahead; Crofting and the CAP; Focus on Fish – Special 6-page section on fish and fishing in Scotland; Money matters; How ‘green’ is the CAP? ; Labour view; Scotland bans GM crops; Short supply chains; Towards a Citizens’ Agricultural Policy. 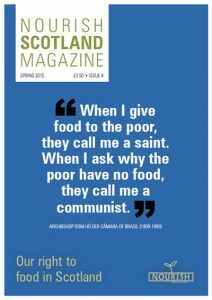 Contents: Editorial – From Food Charity to the Right to Food; Using food waste to feed hungry people is not effective; Food banks don’t solve food poverty – the UK must not institutionalise them; Incorporating the right to food into domestic law; Emergency food aid in Scotland; A global standard for measuring food insecurity; Forward Coupar Angus’ response to food poverty; North Lanarkshire Food Aid. 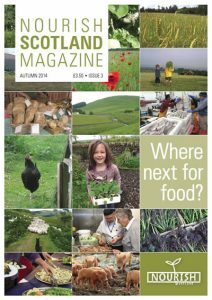 Magazine Issue 3 (PDF 3.3MB) Where Next for Food? Contents: Editorial – Where next for food? Sixteen views on where next for food; Voices from Scottish Commentators: Leslie Riddoch and Alex Renton, Scottish politicians and the Food, Farming, Fishing and Environmental sectors. 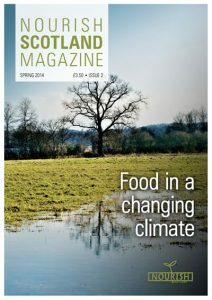 Contents: Antediluvian food policy; Occupy food: Sustainable food can transform Scotland, if we want it to; Delivering food security and reducing the climate impact of food production; Our living earth; Meat: Less and better? ; Food – don’t let a good thing go to waste; Glasgow Local Food Network; Do you fancy living the “good life”? Be careful what you wish for! The Highland Food Challenge. 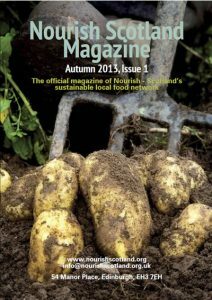 Contents: Introduction; Scotland The Bread; Dairy Country; Wester Hailes Edible Estates; Scotland’s Sanctuary Gardens: dedicated to peace; Preparing for life beyond the organic food niche; WDM Event on Food Sovereignty; Scottish Food & Drink Fortnight 7 – 22nd September 2013; Nourish News; Nourish’s view on the Scottish Rural Development Programme; Sustainable Food City Edinburgh.